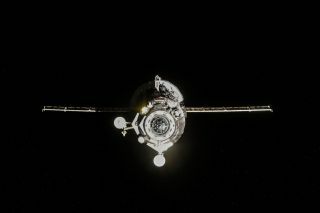 A file photo of a Russian Progress 55 cargo ship leaving the International Space Station in July 2014. Russia's latest cargo ship Progress 59 launched on April 28, 2015, only to suffer a serious malfunction after reaching orbit. The U.S. Air Force has spotted 44 pieces of debris around the spacecraft.